A financial gain that you obtain by the difference between the amount earned and the amount spent on costs. The profit is the key measure of success in a business. As long as a business is running, its profits are a matter of judgement. The profit can be objectively measured only when a business has been dissolved and its assets converted to cash. Goya was a court painter to the Spanish Crown, but aslo a subversive and satirical critic. 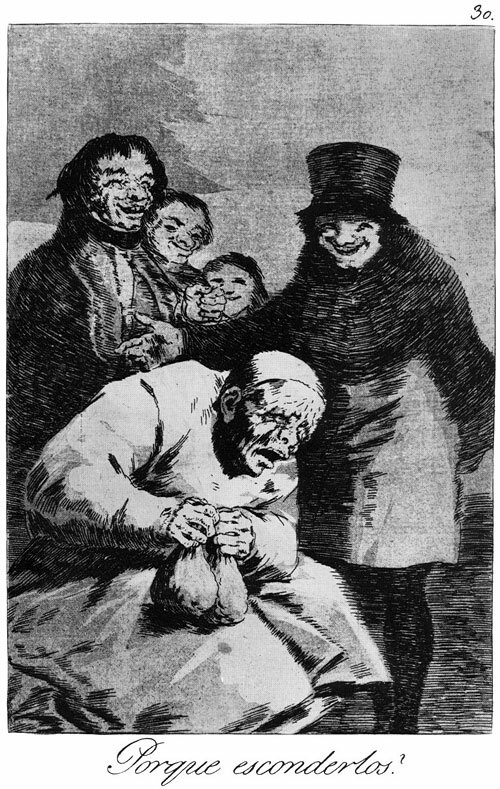 “Los Caprichos” album, published in 1799, consists of 80 aquatint prints that portrayed ruling class’s inability, self-interest, ignorance, weakness and follies of Spanish society. Our King would never be defeated. Why, because his people believe in him. if he was not, the little people like me will see disaster in his war and steer away from it. REF -> Transcript: An anti-war play Mother Courage and Her Children--A chronicle of the Thirty Years War, written in 1939 by Bertolt Brecht. Plot: The saleswoman Courage welcomes the war in which she gains nothing but stands to lose everything. During the play she loses all of her three children, “the war giveth, and the war taketh away” she said. Documentary Theater of War (2008), tracks The Public Theater's production of Bertolt Brecht's Mother Courage and Her Children. Directed by John W. Walter, Staring: Meryl Streep, Kevin Kline and Tony Kushner.